UV paints were very popular over the festive season, as neon parties took hold. Did you know we use neon glitter as well as paint? It looks incredible under black light. We were busy across London, the Home Counties, Bristol, Brighton, Oxford, Cambridge and Birmingham. We’ve worked with old clients and new, each and every one of them our favourite! … Thank you Studio Lambert, Dishoom, River Island, Unilever, Design By Structure, Sledge, Blast Films, Cherry London, Acorn, Selfridges, Whipsnade Nights, Gala Coral, Electric Sunshine, Tesco, Spun Gold TV, HK Strategies, Sharethrough, Discovery Channel, Accenture, KP Snacks, Total Media, Euroclear, CBRE Global Investors, Genting Casinos, Arbuzz, Lewis Silkin LLP, Mintel, Dred, DCM, John Lewis, Leadership Through Sport, Media Force, Cision, Russell Reynolds, Transferwise, Glenigan, Sompocanopius, TUI, Barclays, Found, Kream, JC Decaux, Swan @The Globe, BMA, Protocol Education, The Third Floor Inc., WMP Creative, Natural Motion Films, Scott Dunn, The Social Pantry, By Deluxe, Zibrant Live, Jet 2 Holidays, Countrywide, Tokio Marine Kiln & CAE UK. We fuelled ourselves with mince pies and glitterboxed an eye-watering 88 parties and celebrations in a single month. We face-painted kids’ Birthday parties and glittered weddings, hen do’s, Bar Mitzvahs, Bat Mitzvahs, Christenings and corporate events. Along the way we tried out our new bio-degradable eco-glitters from Eco Stardust and the feedback was as glowing as our neon paint! 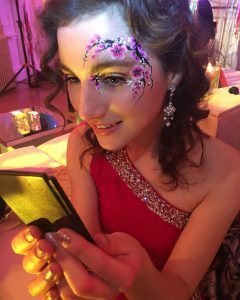 We’re now booking weddings up to the end of 2019 – and glamorous face paint goes down so well at a wedding party. It’s always a privilege to be invited in to share such a big day with families and their friends, with our walkabout kits overflowing with all our most glamorous embellishments. Recent venues have included Upwaltham Barns, Shakespeare’s Globe, Oxcale, Map Maison, Grosvenor House, One Belgravia, Mitton Hall, Mayflower Place, Guildford Golf Club and Kings Chapel Old Amersham. Ticking agency’s boxes is something we love the challenge of and glitter has long been in high demand. Often agencies host their client events at extravagant venues with large, discerning crowds, where we share the floor with high-drama acts of all kinds, from stilt walkers to fire eaters – Miss Balloniverse and The Candy Queens to name but a few. We’ve had an absolute ball adorning the guests of Full Circle, Ultimate Experience, Wish Upon A Party , Design A Party, Dazzle & Fizz Parties, Twizzle Parties, CircusBe, Seven Events, Kru Live, Chaika Events, Atom Events and Private Drama. We’ve seen sudden a rise in the number of Animal Parties – just last week we were walkabout painting around komodo dragons, crocodiles and meerkats. Which provides so much inspiration for the children when they pick their face paint designs. We can highly recommend Safari Pete and The Mini Beast Road Show. Also musical theatre parties by Pixie Parties are fantastic for budding stars! We can’t wait to embark on our fifth year at The Southbank Centre, where our 6-strong team provides face paint for the most popular London event of February half term, The Imagine Children’s Festival. Check out what London Mother has to say about it and see the full programme here. Want to see more? Follow us all on Instagram !